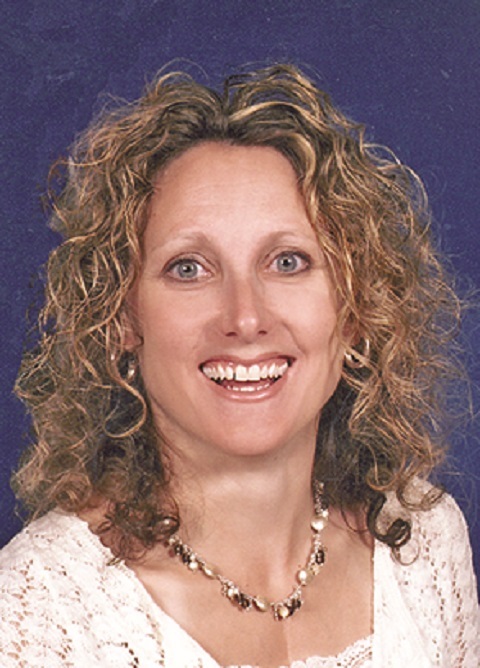 Christine Rae Fabian, age 48 of Wrightstown, passed away early Friday, April 20, 2018 at her home surrounded by her loving family after a two-year battle with cancer. She was born on December 6, 1969 in Broadhead, Wisconsin to the late Stanley and Ruth (Kummer) Meyers. On June 6, 1992 she married Stefan Fabian in Sun Prairie. Christine worked as a high school teacher at John Edwards High School in Port Edwards, Principal at Merrill Middle School, in Oshkosh and most recently as Principal of Howe Elementary School in Green Bay. Christy enjoyed scrapbooking, going on walks and shopping for shoes. Her greatest joy was spending time with her family, especially playing board games. Christy is survived by her husband, Stefan, their children; Michaela, Trevor, Carson and Kamryn, siblings; Michael (Dawn) Meyers, Steve (Mary Jo) Meyers, Rick (Natalie) Meyers, Cindy (Glen) Boedecker and AFS sister, Leen (Marc) Geerkens-Cornil. She is further survived by her mother in law, Marian Fabian, sisters and brothers in law; Jodi (David) Wagner, Jeffrey Fabian, Lisa (Craig) Fabian-Albert, Craig (Michele) Fabian, Tracy Siebers and Nicole (Arin) McClure as well as many nieces, nephews, great nephews, other relatives and friends. Preceding her in death are her parents, her father in law, Howard Fabian and brother in law, Randall Fabian. Family and friends gathered on Wednesday, April 25, 2018 at St. Clare Catholic Church St. Paul Site, 437 Main Street, Wrightstown from 4pm to 7:30 p.m., with a prayer service at 7 p.m. Visitation began again on Thursday, April 26, 2018 at 9:30am until 11:15am at the church, and the mass followed at 11:30 a.m., with Rev. Brian Wideman officiating. Cotter Funeral Home and Crematory assisted the family. Online condolences can be made at www.cotterfuneralhome.com. In lieu of flowers and other expressions of sympathy a memorial fund is being established. The family wishes to extend a special thank you to the Doctors, Nurses and Staff of University Hospital and Clinics and the Carbone Cancer Center of Madison for the exceptional care given to Christy.